These are easy wraps for on-the-go eating. We ate them as our poopy car treats at the farm. As it turns out, Davis does not like cranberries so next time I’m going to try substituting the cranberries for fresh pears or maybe apples. Dried cherries might be good, too. Bake chicken breast at 350 degrees for approximately 45 minutes till very tender; cool. (Or use deli meat). Meanwhile,place cranberries in a small saucepan. Add lemon juice, lemon zest, brown sugar, and water. Bring to a boil. Remove from heat and cool. Spread the two tortillas with the cream cheese and sprinkle on the walnuts. Spread the cranberry mixture over the cream cheese and nuts. Add chicken and spinach. Roll tightly and close with a toothpick or you can place them in plastic wrap and put them in the refrigerator until ready to serve. 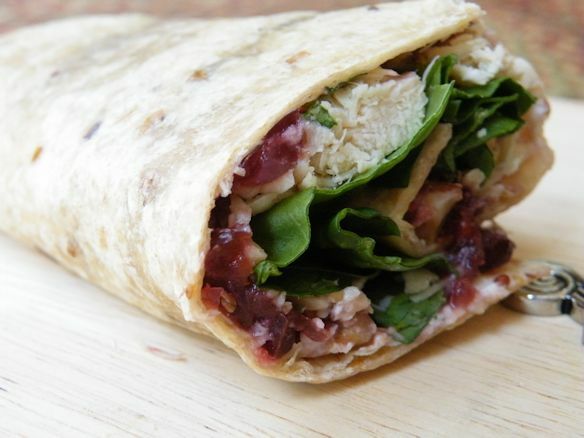 Cut each wrap in half for 4 servings. I think Ashley and Caitlin would like this. I will have to give it a try.